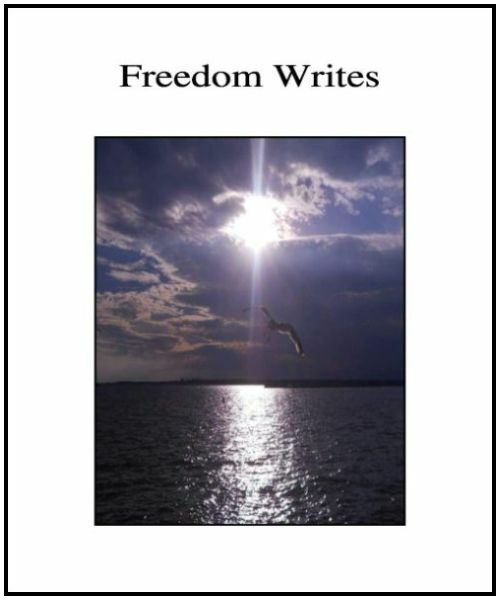 "Freedom Writes is an anthology, a fantastical write in freedom poetry, a continuation of the story of an end to violence against innocents, an end to oppression in the United States and everywhere. The poetry reads as soul affirmations for the rights of all oppressed people for civil rights and self-autonomy under God. This book was compiled by Kimberlynne Darby Newton, a Poet and former professor at Alabama State University and Poet Anne Rhodes. The Contributing Poets come from all walks of life, they are teachers, Veterans and disabled Veterans, writers, artists, musicians, singers, photographers, filmmakers, psychotherapists, journalists, students, wives, husbands, parents, and children. Also, this book is international including poets from the U.K., Ireland, Nigeria, Kenya, India, New Zealand, Pakistan, South Africa, and from across the United States. The theme of the Anthology is Freedom, a cry freedom in violent times when people’s rights and safety are being infringed upon by an often oppressive systemic undertow in N.A. In the violence of Existential absurdist theatre, the black culture does not have the same structure as the dominant white culture, as people and ideas clash in the idea of what America should be, violence rains down. Absurdist theatre is a conflict of wills, one person or group of people may want to do something, live a certain way and another person or group of people may want to do something, live a certain way and the two ideals clash manifesting conflict and sometimes violence. This systemic violence does not only apply to racial tensions but exists when people do not have an idea of God, have not been mentored or discerned effectively for love and work, when they do not understand themselves enough, when they are too emotionally hurt, and conflict occurs. This art installation is a wave in light as people express themselves in the the way of love and poetry for their ideal of peace, love and freedom. Michael Ellis, an American Poet who teaches poetry to prison inmates is an iconic write in Freedom Writes. His poem SOAR is a classic presentation of Hip-Hop/Harlem Renaissance influenced poetry that captures the imagination and creates ecstatic experience, as you become a bird transcending in the sky. A fantastical poem. Kimberlynne Darby Newton, an American Poet, formerly a history professor at an Alabama University, is a study in the black sacred feminine, a song of love. As one of the voices of black America she is an instrument of the language, a song of freedom. Poet Newton rocs. Visions of America . . . in a democracy, people have the right to have their say, to talk, to express their opinions, the Artists/Poets have a right to create and celebrate the society, they are the lifeblood of the soul of the Community. The role of the Artist/Poet is to enlighten, report abuses, tell the truth, celebrate, create new mythologies, heal wounds. Freedom Writes is a song of freedom, a song of democracy, of the sacrament of love in action in autonomy under God. A discovery of a world in alignment with peace, a system that is righteous in alignment with Community peace and prosperity. All God asks of us is to follow your calling for love, follow your calling for work and not hurt each other. All wars are just broken love affairs. In all arguments, it is important to be on the right side of God, then your opinion is righteous, ideally there would be no arguements. Prejudice and human rights abuse is often a reflection of self-esteem issues, making a person or a group of people “the Other” is often a way for the perpetrator (perhaps someone who has had too many lovers and is suffering or who has an ego complex and thinks he is better than others or has soul colour discordance or who holds false beliefs) to blow off anger and insecurity, to feel better. Violence against an innocent is suffering both for the victim and for the person who caused it, it is karmic dissonance, it will be magnified and reflected back to the trespasser eventually, all trespass will come to light through the Oracles/village elders, there is a natural reckoning through the Holy Spirit way for justice and peace. A posse of wild horses running in a river, the day . . . the light and water shimmers down, running, running wild, running free, Freedom Writes, a brilliant read compiled by Kimberlynne Darby Newton". I’m too beautiful to whore. reservoir, that rupture, a rushing flow, drained. soothing love, he wants to be loved.